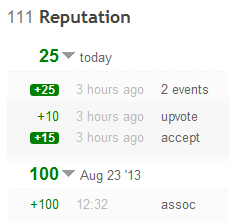 I just registered on SE superuser and noticed, that when my first answer got accepted+upvoted, my reputation was increased to 111. Where does that number come from? Forgive me if I am overlooking something obvious. EDIT 24.06.14: With a delay of about one day, reputation is now shown correctly. My best guess here, based on some log data, is a race condition where the upvote and the accept vote were registered almost exactly at the same time, causing one update to be swallowed. Such a race is improbable and rare, but possible. For those cases where this does happen, there's an automated daily job that catches these inconsistencies and fixes the reputation, which is why the number was correct after a day. As it seems, the problem has resolved itself. It was probably something related to caching.